This dish is deliciously hearty, great as a hot curry dish on its own – I have it on a bed of spinach or even as a cold salad. With the sweet potato, this has just the right balance of sweet and savoury. There was some dill yoghurt in the fridge, which I used, but it’s one of those additions that isn’t entirely necessarily… just like the almonds, and the chopped red chillies on top. And in case that’s not enough options, if you have time to bake another sweet potato, then present this curry on top of the baked sweet potato half, rather like a filling. Maybe, just maybe, this dish has too many options! But it’s always good to have options, right? Like the sprinkling of coriander – although, this is, for me, is a must! Start by boiling the quinoa for 20-25 minutes on low heat until the quinoa is cooked – it should have soaked up all the water and will be soft. While this is boiling, chop the sweet potato in small cubes and boil in a separate pan in a small amount of water, again on low heat. This could take around 30 minutes – check when sweet potato is soft and cooked. In the meantime, chop the avocado and onions, again into cubes or medium sized pieces. Once the sweet potato is cooked, pour out the water from the sweet potato. Let me know what you think of this recipe if you make it! 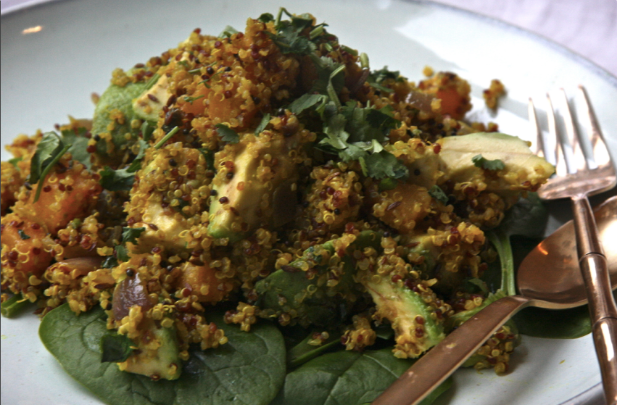 I’ve had curried sweet potato many times, but never with quinoa and avocado. The spice mix is also interesting, as it is not like the North Indian spicing we generally have (due to my husband’s background). I will have to look up her website to see whereabouts this is from.